Back to bento making again. Everything seems to be back to normal since the kids are back to the school today. My daughter starts her first day in Grade 5 and my son in Grade 2. They are excited with some of the new friends and the new teachers in their class. Today's bento is a little happy elephant. Crossed the road safely to the school. I made it from egg sheets, carrot, crab stick, and nori. Inside the box : Chinese cabbage stir fry, black bean garlic chicken, omelet, broccoli, and grape tomatoes. Lia, miss u so much, especially your cute bentos (^.^) Finally today I see your blog appears as 1st place in my bloglist. Welcome back Lia!!!! Miss your posts so much!!! Lovely bento as usual and hope your kids have a great time in school too! I only knew now that Jakarta starts their new school year in the middle of the year! So nice to see your blog back! Have missed it! You have inspired me to make more bento! Hi Lia! Love this sweet and so original bento--its really creative, totally enjoy this adorable elephant crossing guard...wonderful! Thanks for the big smile of delight, and wishing your kids a great new school year! I must find one day and make the egg sheet as your tutorial, hopefully I can make a smooth one like yours! The elephant is so, so cute! 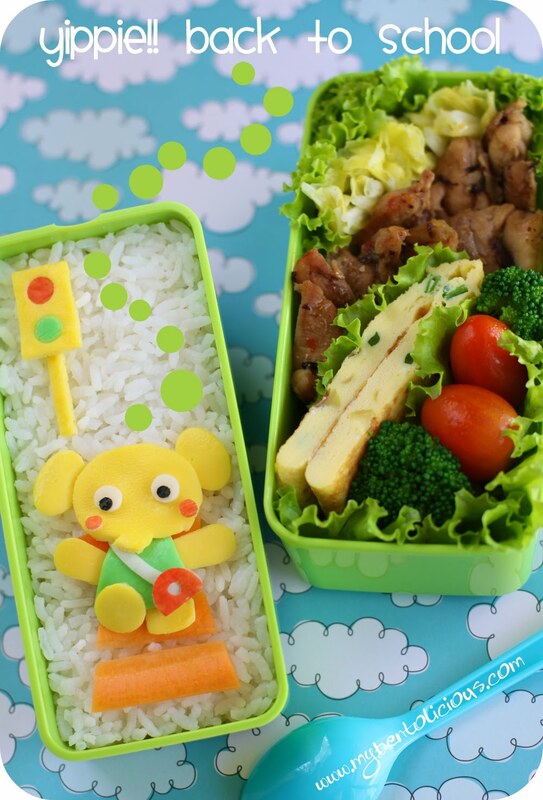 This is a great back to school bento! Our school has a little over a month before we are back. Good to have you back. The lighting in this photo is really good. I didn't get the Yum-Yum Bento Box Book yet. @Lyndsey : Thanks a lot Lyndsey! I thought it was a little bit to dark :) It seems I have to try different spots to find the best one. I'm so sorry for the delay for your bento book. I sent it on June, 30. I will check it tomorrow morning with my post office and let you know later. Hi Lia, Sorry I'm late again. I don't know why I'm getting busier these days, hope everything can get back to normal next week. @Kuusou : Thanks a lot Kuusou for your nice comment! This is too adorable! You are so creative, Lia. The elephant looks wonderful and I am amazed at the way you made the crosswalk and the signal. It's crazy to think that a piece of art like this will just get gobbled up at lunch. But I guess that makes us appreciate each one that much more. :-) And the other ingredients sound delicious too! Welcome back to bentos. @prince n princess mum : Thanks a lot!